Xunhua is the only county of Sala peole, and Wendu village is the home town of the 10th Banchan Lama, head of that school and the whole of Vajrayana, or Tibetan, Buddhism; Along the way from Xunhua to Tongren, there are stunning landscapes and some interesting Hui (Chinese Muslim) villages. May to early October. The yellow blossom will be available everywhere from late May to early July. Late August to early September is the best time to view Kanbula National Forest because the tree leaves turn yellow and the lake green. From Late January to February the locals celebrate their traditonal New Year, which is worth visiting. 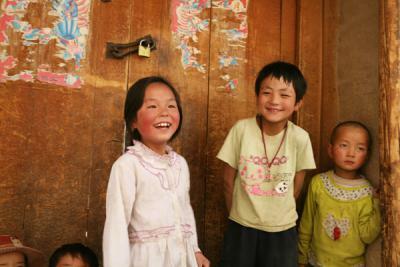 While in Tongren, we reach heights of up to 2,491 meters above sea level. * Shanghai departure: take a previous afternoon flight into Xining and stay overnight; then meet the Beijing participants next morning. Flight Shanghai Pudong - Xi'an (stopover) - Xining (4hours). * If you go from other locale, we will check the available flights from your locale to Xining. Upon arrival, we will drive to Xunhua County, the only town in China dominant by Sala People, one ethnic group believing Muslim. 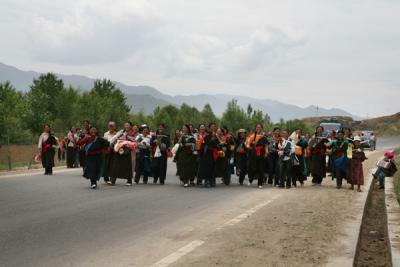 Then we will visit the 10th Panchen Lama residence in Wendu Village. Along the way, we pass by stunning views of mountains and lush plants and yellow reap blossom (late May to early July). 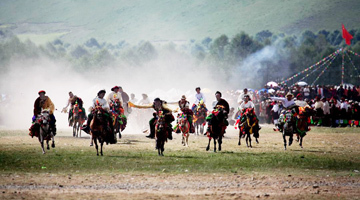 We will visit interesting Hui (Chinese Muslim wearing white caps) people's villages and then enter into meadow area with goats and yaks and Tibetan nomad herders until we arrive in Tongren in the evening and stay overnight. Then we visit the artistic treasures of Nianduhu monastery, where the large-scale barbola mural is considered the best in the area, and the monastery also houses a collection of embroidery and other rare cultural relics. In the afternoon we visit the Guomari Monastery known for finely crafted sculptures. Climbing up the white stupa of Guomari, we will have a bird-eye view of surrounding villages and mountains. In the later afternoon we head to the hidden and serene village in the mountains in Qukuhu. The clay houses are neatly built along the slope with stupas and monasteries on the summit. 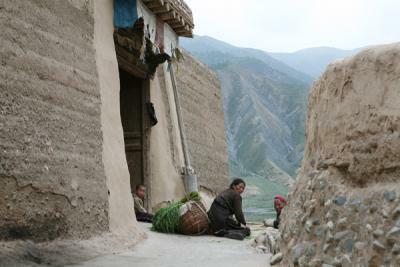 The monks and Tibetan villages are simple and friendly. They wash their clothes in the water running down from the mountains or are dedicated to rotating the prayer wheels. 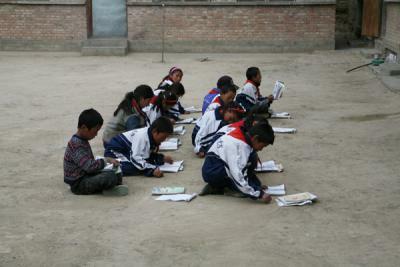 We will also check the village primary school and meet the kids in the classroom. In the afternoon, we drive 3 hours to Jainca and enter into Kanbla National Park. Check in the hotel in the park and stay overnight. We visit one typical Danxia landscape area, and climb up along the steps in the wood to another peak. Mount on the summit and take a good view of surrounding Danxia (red color) peaks. After lunch, we drive to Nanzong Valley, and hike in the 5 kilometer long Nanzong Valley, or you choose to take the shuttle bus to tour the valley. Featured by high mountain, deep valley, thick woods and quiet environment, it is composed of dense forest, deflated hills and small intermountain basins and clear brooks, red-cloud landforms and religious temples. We will visit the Nanzong Temple and Nanzong Buddhist Nunnery, which are the only religious Buddhist places with monks and nuns coexist with each other in Qinghai Province China. This morning we drive to Nanzong Valley again and take a boat ride on the green water of the reservoir (part of the Yellow River) for sightseeing. Then we leave the forest park and head back to Xining (2.5 hours). After lunch, transfer to the airport to fly out. You will not stay in high quality 4-star hotels that CCC usually offer but some local 3 star hotels in the remote areas in Qinghai. However the hotels are all up to acceptable level with clean bedding and separate bathroom. Some climbing, mild hiking, and small boat ride are involved during the tour, which may be difficult for people who are not in good physical shape. Please note that some climbing, mild hiking, and small boat ride are involved during the tour, which may be difficult for people who are not in good physical shape. Please also note that the flights or timing of flights mentioned in the above itinerary may change subject to ticket availability and airline scheduling. Alternative hotels of similar standards will be used if any of the hotels mentioned in the itinerary is unable to provide enough accommodation. June - early September is the appropriate season for Qinghai Lake. This morning drive to Kumbum Monastery (Ta'er), a Buddhist monastery in the suburb of Xining. 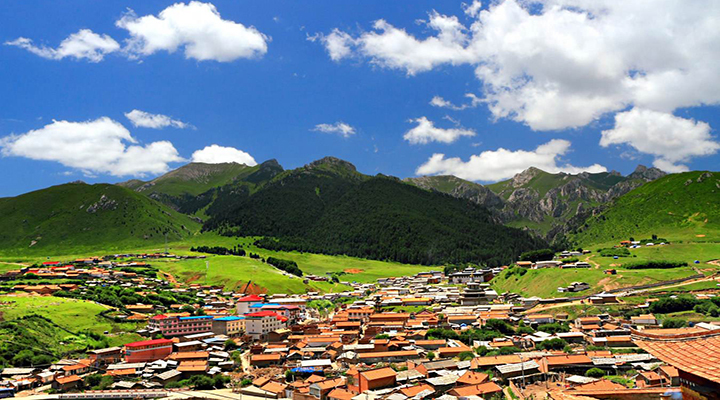 Kumbum was founded in 1583 in a narrow valley close to the village of Lusar in the Tibetan cultural region of Amdo. It was ranked in importance as second only to Lhasa. After lunch, drive to Qinghai Lake and arrive in the evening. Stay overnight in a hotel near Qinghai Lake. Drive to the Bird Island along the north line of Qinghai Lake to see large groups of birds and seagulls and the Egg Island (birds are available from June to early September. June is at its best) . Then drive along the south line of Qinghai Lake, the largest salt lake in China. 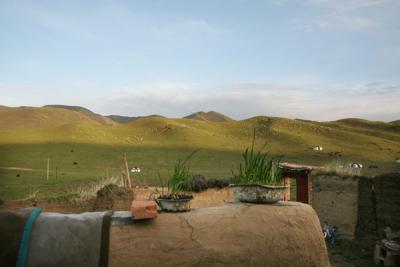 Along the journey, we will stop by for pictures and take some walk on the meadow and visit some Tibetan herders. Drive back to Xining in the later afternoon and transfer to the airport to fly out.